The elemental components of organic matter are cycled through the biosphere in an interconnected process called the biogeochemical cycle. Carbon, nitrogen, hydrogen, oxygen, phosphorus, and sulfur are conserved and recycled in the atmosphere, on land, in water, or beneath the earth’s surface. Materials are recycled via erosion, weathering, water drainage, and the movement of tectonic plates. Water is essential to all living processes, while carbon is found in all organic macromolecules. Nitrogen and phosphorus are major components of nucleic acids and play major roles in agriculture. Sulfur plays a role in the three-dimensional folding of proteins and is released into the atmosphere by the burning of fossil fuels. Energy flows directionally through ecosystems, entering as sunlight (or inorganic molecules for chemoautotrophs) and leaving as heat during the many transfers between trophic levels. However, the matter that makes up living organisms is conserved and recycled. The six most common elements associated with organic molecules (carbon, nitrogen, hydrogen, oxygen, phosphorus, and sulfur) take a variety of chemical forms and may exist for long periods in the atmosphere, on land, in water, or beneath the earth’s surface. Geologic processes, such as weathering, erosion, water drainage, and the movement of the continental plates, all play a role in this recycling of materials. Because geology and chemistry have major roles in the study of this process, the recycling of inorganic matter between living organisms and their environment is called a biogeochemical cycle. The components of organic molecules are constantly being stored and recycled as part of their biogeochemical cycle. Water, which contains hydrogen and oxygen, is essential to all living processes. The hydrosphere is the area of the earth where water movement and storage occurs. Water can be liquid on the surface and beneath the surface or frozen (rivers, lakes, oceans, groundwater, polar ice caps, and glaciers) or exist as water vapor in the atmosphere. Carbon, found in all organic macromolecules, is an important constituent of fossil fuels. Nitrogen, a major component of our nucleic acids and proteins, is critical to human agriculture. Phosphorus, a major component of nucleic acid (along with nitrogen), is one of the main ingredients in artificial fertilizers used in agriculture and their associated environmental impacts on our surface water. Sulfur, critical to the 3–D folding of proteins (as in disulfide binding), is released into the atmosphere by the burning of fossil fuels, such as coal. Importance of the hydrosphere: Earth has a hydrosphere, where water movement and storage occurs. It is important for leaching certain components of organic matter into rivers, lakes, and oceans, and is a reservoir for carbon. The cycling of all of these elements is interconnected. For example, the movement of water is critical for the leaching of nitrogen and phosphate into rivers, lakes, and oceans. Furthermore, the ocean itself is a major reservoir for carbon. Thus, mineral nutrients are cycled, either rapidly or slowly, through the entire biosphere, from one living organism to another, and between the biotic and abiotic world. Water has a large effect on climate, ecosystems, and living organisms and is continuously cycled through the environment. Water cycling affects the climate, transports minerals, purifies water, and replenishes the land with fresh water. Water with a longer residence time, such as water in oceans and glaciers, is not available for short-term cycling, which occurs via evaporation. Surface water evaporates (water to water vapor) or sublimates (ice to water vapor), which deposits large amounts of water vapor into the atmosphere. Water vapor in the atmosphere condenses into clouds and is eventually followed by precipitation, which returns water to the earth’s surface. Rain percolates into the ground, where it may evaporate or enter bodies of water. Surface runoff enters oceans directly or via streams and lakes. Water is the basis of all living processes. More than half of the human body is made up of water, while human cells are more than 70 percent water. Thus, most land animals need a supply of fresh water to survive. However, when examining the stores of water on earth, 97.5 percent of it is non-potable salt water. Of the remaining water, 99 percent is locked underground as water or as ice. Thus, less than 1 percent of fresh water is easily accessible from lakes and rivers. Many living things, such as plants, animals, and fungi, are dependent on the small amount of fresh surface water supply, a lack of which can have massive effects on ecosystem dynamics. Humans, of course, have developed technologies to increase water availability, such as digging wells to harvest groundwater, storing rainwater, and using desalination to obtain drinkable water from the ocean. Although this pursuit of drinkable water has been ongoing throughout human history, the supply of fresh water is still a major issue in modern times. Water availability: Only 2.5 percent of water on earth is fresh water. Less than 1 percent of fresh water is easily accessible to living things. Water cycling is extremely important to ecosystem dynamics as it has a major influence on climate and, thus, on the environments of ecosystems. For example, when water evaporates, it takes up energy from its surroundings, cooling the environment. When it condenses, it releases energy, warming the environment. The evaporation phase of the cycle purifies water, which then replenishes the land with fresh water. The flow of liquid water and ice transports minerals across the globe. It is also involved in reshaping the geological features of the earth through processes including erosion and sedimentation. 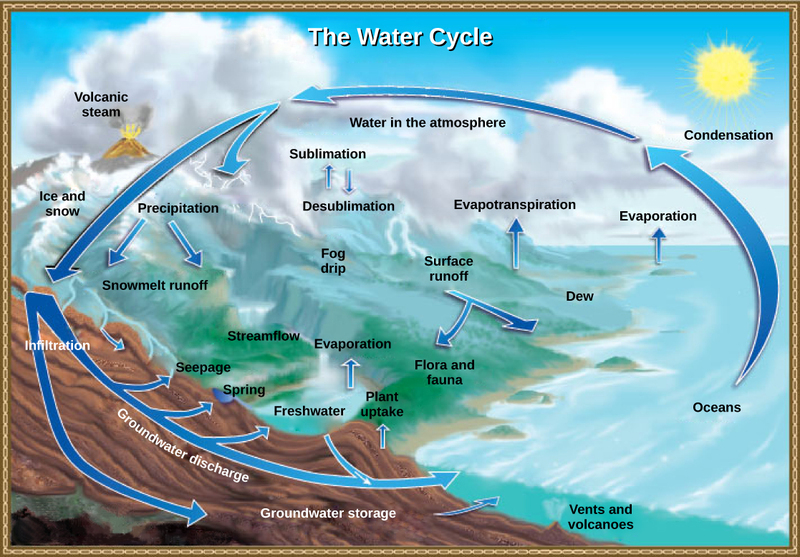 The water cycle is also essential for the maintenance of most life and ecosystems on the planet. Most of the water on earth is stored for long periods in the oceans, underground, and as ice. Residence time is a measure of the average time an individual water molecule stays in a particular reservoir. A large amount of the earth’s water is locked in place in these reservoirs as ice, beneath the ground, and in the ocean, and, thus, is unavailable for short-term cycling (only surface water can evaporate). 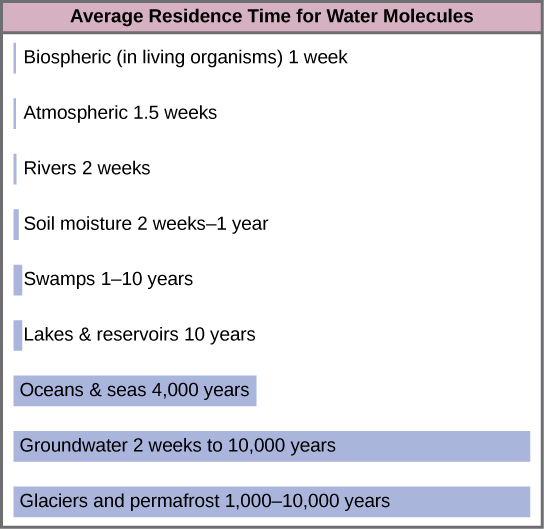 Residence time of water: This graph shows the average residence time for water molecules in the earth’s water reservoirs. Most of the earth’s water is unavailable for use because it is locked in ice, beneath the ground, or in the oceans. Cycling of water: Water from the land and oceans enters the atmosphere by evaporation or sublimation, where it condenses into clouds and falls as rain or snow. Precipitated water may enter freshwater bodies or infiltrate the soil. The cycle is complete when surface or groundwater reenters the ocean. The water cycle is driven by the sun’s energy as it warms the oceans and other surface waters. This leads to the evaporation (water to water vapor) of liquid surface water and the sublimation (ice to water vapor) of frozen water, which deposits large amounts of water vapor into the atmosphere. Over time, this water vapor condenses into clouds as liquid or frozen droplets, which is eventually followed by precipitation (rain or snow), returning water to the earth’s surface. Rain eventually percolates into the ground, where it may evaporate again (if it is near the surface), flow beneath the surface, or be stored for long periods. More easily observed is surface runoff: the flow of fresh water either from rain or melting ice. Runoff can then make its way through streams and lakes to the oceans or flow directly to the oceans themselves. Rain and surface runoff are major ways in which minerals, including carbon, nitrogen, phosphorus, and sulfur, are cycled from land to water. Carbon enters the atmosphere in the form of carbon dioxide via the carbon cycle and returns to organic carbon via photosynthesis. Carbon is present in all organic molecules; carbon compounds contain large amounts of energy, which humans use as fuel. The biological carbon cycle is the rapid exchange of carbon among living things; autotrophs use carbon dioxide produced by heterotrophs to produce glucose and oxygen, which are then utilized by heterotrophs. The biogeochemical cycle occurs at a much slower rate than the biological cycle since carbon is stored in carbon reservoirs for long periods of time. Carbon dioxide from the atmosphere dissolves in water, combining with water molecules to form carbonic acid, which then ionizes to carbonate and bicarbonate ions. Most of the carbon in the ocean is in the form of bicarbonate ions, which can combine with seawater calcium to form calcium carbonate (CaCO3), a major component of marine organism shells. Carbon can enter the soil as a result of the decomposition of living organisms, the weathering of rocks, the eruption of volcanoes, and other geothermal systems. Carbon, the second most abundant element in living organisms, is present in all organic molecules. Its role in the structure of macromolecules is of primary importance to living organisms. Carbon compounds contain especially- high forms of energy, which humans use as fuel. Since the 1800s (the beginning of the Industrial Revolution), the number of countries using massive amounts of fossil fuels increased, which raised the levels of carbon dioxide in the atmosphere. This increase in carbon dioxide has been associated with climate change and other disturbances of the earth’s ecosystems. It is a major environmental concern worldwide. 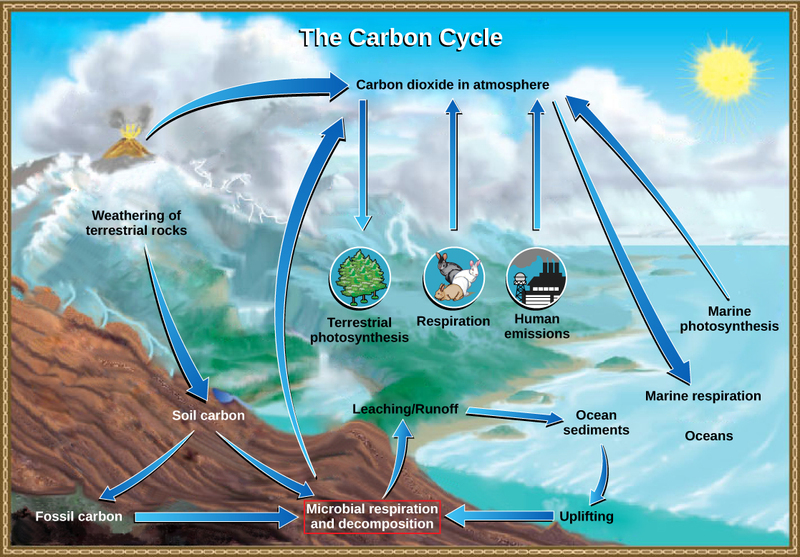 The carbon cycle is most easily studied as two interconnected sub-cycles: one dealing with rapid carbon exchange among living organisms and the other dealing with the long-term cycling of carbon through geologic processes. Carbon cycle: Carbon dioxide gas exists in the atmosphere and is dissolved in water. Photosynthesis converts carbon dioxide gas to organic carbon, while respiration cycles the organic carbon back into carbon dioxide gas. Long-term storage of organic carbon occurs when matter from living organisms is buried deep underground and becomes fossilized. Volcanic activity and human emissions bring this stored carbon back into the carbon cycle. Living organisms are connected in many ways, even between ecosystems. A good example of this connection is the exchange of carbon between autotrophs and heterotrophs. Carbon dioxide is the basic building block that most autotrophs use to build multi-carbon, high-energy compounds, such as glucose. The energy harnessed from the sun is used by these organisms to form the covalent bonds that link carbon atoms together. These chemical bonds store this energy for later use in the process of respiration. 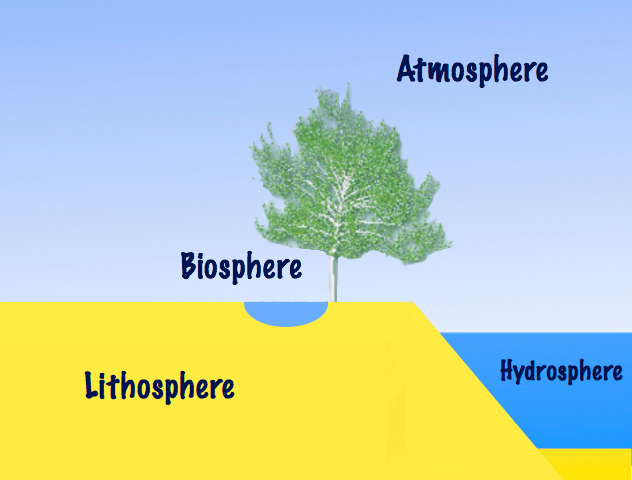 Most terrestrial autotrophs obtain their carbon dioxide directly from the atmosphere, while marine autotrophs acquire it in the dissolved form (carbonic acid, H2CO3−). However carbon dioxide is acquired, a by-product of the process is oxygen. The photosynthetic organisms are responsible for depositing approximately 21 percent of the oxygen content in the atmosphere that we observe today. Heterotrophs acquire the high-energy carbon compounds from the autotrophs by consuming them and breaking them down by respiration to obtain cellular energy, such as ATP. The most efficient type of respiration, aerobic respiration, requires oxygen obtained from the atmosphere or dissolved in water. Thus, there is a constant exchange of oxygen and carbon dioxide between the autotrophs (which need the carbon) and the heterotrophs (which need the oxygen). Gas exchange through the atmosphere and water is one way that the carbon cycle connects all living organisms on Earth. The movement of carbon through the land, water, and air is complex and, in many cases, it occurs much more slowly than the biological carbon cycle. Carbon is stored for long periods in what are known as carbon reservoirs, which include the atmosphere, bodies of liquid water (mostly oceans), ocean sediment, soil, land sediments (including fossil fuels), and the earth’s interior. As stated, the atmosphere, a major reservoir of carbon in the form of carbon dioxide, is essential to the process of photosynthesis. The level of carbon dioxide in the atmosphere is greatly influenced by the reservoir of carbon in the oceans. The exchange of carbon between the atmosphere and water reservoirs influences how much carbon is found in each location; each affects the other reciprocally. Carbon dioxide (CO2) from the atmosphere dissolves in water, combining with water molecules to form carbonic acid. It then ionizes to carbonate and bicarbonate ions. Formation of bicarbonate: Carbon dioxide reacts with water to form bicarbonate and carbonate ions. More than 90 percent of the carbon in the ocean is found as bicarbonate ions. Some of these ions combine with seawater calcium to form calcium carbonate (CaCO3), a major component of marine organism shells. These organisms eventually form sediments on the ocean floor. Over geologic time, the calcium carbonate forms limestone, which comprises the largest carbon reservoir on earth. On land, carbon is stored in soil as a result of the decomposition of living organisms or the weathering of terrestrial rock and minerals. This carbon can be leached into the water reservoirs by surface runoff. Deeper underground, on land and at sea, are fossil fuels: the anaerobically-decomposed remains of plants that take millions of years to form. Fossil fuels are considered a non-renewable resource because their use far exceeds their rate of formation. A non-renewable resource is either regenerated very slowly or not at all. Another way for carbon to enter the atmosphere is from land by the eruption of volcanoes and other geothermal systems. Carbon sediments from the ocean floor are taken deep within the earth by the process of subduction: the movement of one tectonic plate beneath another. Carbon is released as carbon dioxide when a volcano erupts or from volcanic hydrothermal vents. Carbon dioxide is also added to the atmosphere by the breeding and raising of livestock. The large numbers of land animals raised to feed the earth’s growing population results in increased carbon dioxide levels in the atmosphere due to farming practices, respiration, and methane production. This is another example of how human activity indirectly affects biogeochemical cycles in a significant way. Although much of the debate about the future effects of increasing atmospheric carbon on climate change focuses on fossils fuels, scientists take natural processes, such as volcanoes and respiration, into account as they model and predict the future impact of this increase. Nitrogen, the most abundant gas in the atmosphore, is cycled through the biosphere via the multi-step process of nitrogen fixation, which is carried out by bacteria. Bacteria, such as cyanobacteria, convert nitrogen into nitrogen gas via nitrogen fixation. Nitrogen fixation occurs in three steps: ammonification, nitrification, and denitrification. Human activity can release nitrogen into the environment by the combustion of fossil fuels and by the use of artificial fertilizers in agriculture. Atmospheric nitrogen is responsible for acid rain, the release of greenhouse gasses, and eutrophication. Nitrogen fixation can be performed by marine bacteria; nitrogen falls to the ocean floor as sediment and is then moved to land, becoming incorporated into terrestrial rock. Getting nitrogen into the living world is difficult. Plants and phytoplankton are not equipped to incorporate nitrogen from the atmosphere (which exists as tightly-bonded, triple-covalent N2), even though this molecule comprises approximately 78 percent of the atmosphere. Nitrogen enters the living world via free-living and symbiotic bacteria, which incorporate nitrogen into their macromolecules through nitrogen fixation (conversion of N2). Cyanobacteria live in most aquatic ecosystems where sunlight is present; they play a key role in nitrogen fixation. Cyanobacteria are able to use inorganic sources of nitrogen to “fix” nitrogen. Rhizobium bacteria live symbiotically in the root nodules of legumes (such as peas, beans, and peanuts), providing them with the organic nitrogen they need. Free-living bacteria, such as Azotobacter, are also important nitrogen fixers. Organic nitrogen is especially important to the study of ecosystem dynamics as many ecosystem processes, such as primary production and decomposition, are limited by the available supply of nitrogen. 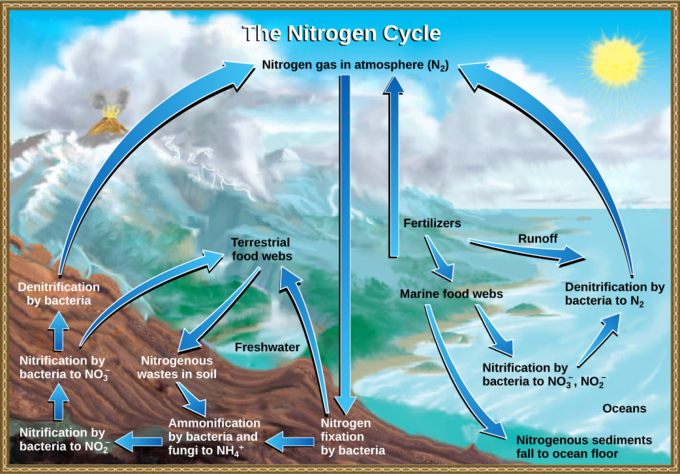 The nitrogen that enters living systems by nitrogen fixation is successively converted from organic nitrogen back into nitrogen gas by bacteria. This process occurs in three steps in terrestrial systems: ammonification, nitrification, and denitrification. First, the ammonification process converts nitrogenous waste from living animals or from the remains of dead animals into ammonium (NH4+) by certain bacteria and fungi. Second, the ammonium is converted to nitrites (NO2−) by nitrifying bacteria, such as Nitrosomonas, through nitrification. Subsequently, nitrites are converted to nitrates (NO3−) by similar organisms. Third, the process of denitrification occurs, whereby bacteria, such as Pseudomonas and Clostridium, convert the nitrates into nitrogen gas, allowing it to re-enter the atmosphere. Nitrogen fixation: Nitrogen enters the living world from the atmosphere via nitrogen-fixing bacteria. This nitrogen and nitrogenous waste from animals is then processed back into gaseous nitrogen by soil bacteria, which also supply terrestrial food webs with the organic nitrogen they need. Human activity can release nitrogen into the environment by two primary means: the combustion of fossil fuels, which releases different nitrogen oxides, and the use of artificial fertilizers in agriculture, which are then washed into lakes, streams, and rivers by surface runoff. Atmospheric nitrogen is associated with several effects on earth’s ecosystems, including the production of acid rain (as nitric acid, HNO3) and greenhouse gas (as nitrous oxide, N2O), potentially causing climate change. A major effect from fertilizer runoff is saltwater and freshwater eutrophication: a process whereby nutrient runoff causes the excess growth of microorganisms, depleting dissolved oxygen levels and killing ecosystem fauna. A similar process occurs in the marine nitrogen cycle, where the ammonification, nitrification, and denitrification processes are performed by marine bacteria. Some of this nitrogen falls to the ocean floor as sediment, which can then be moved to land in geologic time by uplift of the earth’s surface, becoming incorporated into terrestrial rock. Although the movement of nitrogen from rock directly into living systems has been traditionally seen as insignificant compared with nitrogen fixed from the atmosphere, a recent study showed that this process may indeed be significant and should be included in any study of the global nitrogen cycle. Phosphorus is an essential element of living things, but, in excess, it can cause damage to ecosystems. Phosphorus, a major component of nucleic acid and phospholipids, also makes up the supportive components of our bones; it is often necessary for growth in aquatic ecosystems. Phosphates (PO43−) are sent into rivers, lakes, and the ocean by leaching and natural surface runoff. Phosphate-containing ocean sediments slowly move to land by the uplifting of areas of the earth’s surface. Excess phosphorus and nitrogen in the ecosystem leads to the death of many organisms, causing dead zones. Dead zones are caused by by eutrophication, oil spills, dumping of toxic chemicals, and other human activities. Phosphorus is an essential nutrient for living processes. It is a major component of nucleic acid, both DNA and RNA; of phospholipids, the major component of cell membranes; and, as calcium phosphate, makes up the supportive components of our bones. Phosphorus is often the limiting nutrient (necessary for growth) in aquatic ecosystems. Phosphorus occurs in nature as the phosphate ion (PO43−). In addition to phosphate runoff as a result of human activity, natural surface runoff occurs when it is leached from phosphate-containing rock by weathering, thus sending phosphates into rivers, lakes, and the ocean. This rock has its origins in the ocean. Phosphate-containing ocean sediments form primarily from the bodies of ocean organisms and from their excretions. However, in remote regions, volcanic ash, aerosols, and mineral dust may also be significant phosphate sources. This sediment then is moved to land over geologic time by the uplifting of areas of the earth’s surface. Phosphorus cycle: In nature, phosphorus exists as the phosphate ion (PO43−). 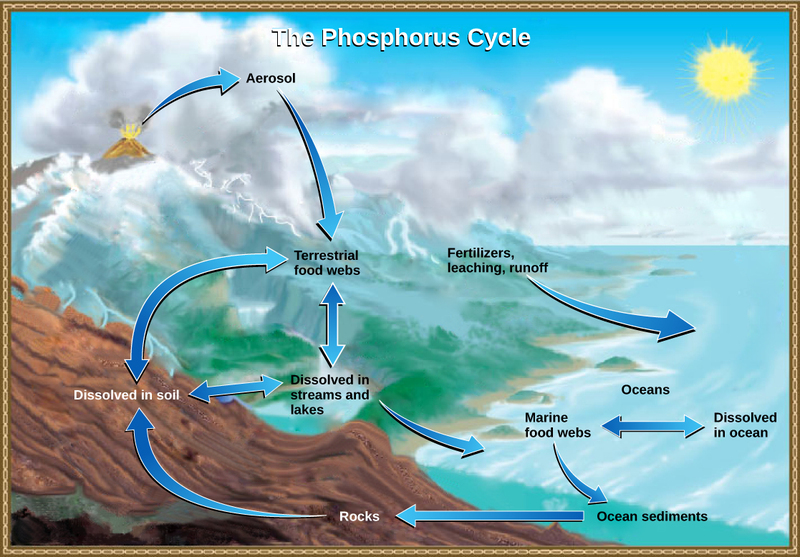 Weathering of rocks and volcanic activity releases phosphate into the soil, water, and air, where it becomes available to terrestrial food webs. Phosphate enters the oceans via surface runoff, groundwater flow, and river flow. Phosphate dissolved in ocean water cycles into marine food webs. Some phosphate from the marine food webs falls to the ocean floor, where it forms sediment. Phosphorus is also reciprocally exchanged between phosphate dissolved in the ocean and marine ecosystems. The movement of phosphate from the ocean to the land and through the soil is extremely slow, with the average phosphate ion having an oceanic residence time between 20,000 and 100,000 years. Excess phosphorus and nitrogen that enters these ecosystems from fertilizer runoff and from sewage causes excessive growth of microorganisms and depletes the dissolved oxygen, which leads to the death of many ecosystem fauna, such as shellfish and finfish. This process is responsible for dead zones in lakes and at the mouths of many major rivers. Dead zones: Dead zones occur when phosphorus and nitrogen from fertilizers cause excessive growth of microorganisms, which depletes oxygen, killing flora and fauna. 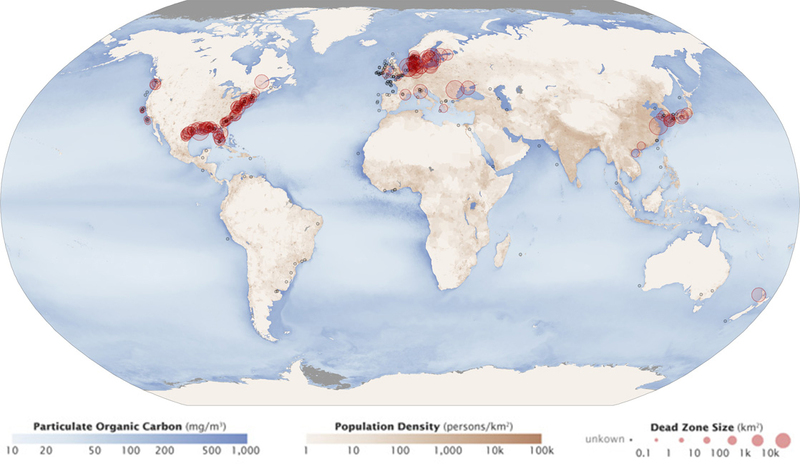 Worldwide, large dead zones are found in coastal areas of high population density. A dead zone is an area within a freshwater or marine ecosystem where large areas are depleted of their normal flora and fauna. These zones can be caused by eutrophication, oil spills, dumping of toxic chemicals, and other human activities. The number of dead zones has been increasing for several years; more than 400 of these zones were present as of 2008. One of the worst dead zones is off the coast of the United States in the Gulf of Mexico, where fertilizer runoff from the Mississippi River basin has created a dead zone of over 8,463 square miles. Phosphate and nitrate runoff from fertilizers also negatively affect several lake and bay ecosystems, including the Chesapeake Bay in the eastern United States, which was one of the first ecosystems to have identified dead zones. Sulfur is deposited on land as precipitation, fallout, and rock weathering, and reintroduced when organisms decompose. Sulfur is an essential element for the macromolecules of living things since it determines the 3-D folding patterns of proteins. On land, sulfur enters the atmosphere via acid rain, fallout, the weathering of rocks, decompostion of organic materials, and geothermal vents. Sulfur enters the ocean via runoff, fallout, and underwater geothermal vents; some marine ecosystems also rely on chemoautotrophs as a sulfur source. The burning of fossil fuels increases the amount of sulfide in the atmosphere and causes acid rain. Acid rain is corrosive rain that causes damage to aquatic ecosystems by lowering the pH of lakes, killing many of the resident fauna; it also degrades buildings and human-made structures. Sulfur is an essential element for the macromolecules of living things. As a part of the amino acid cysteine, it is involved in the formation of disulfide bonds within proteins, which help to determine their 3-D folding patterns and, hence, their functions. 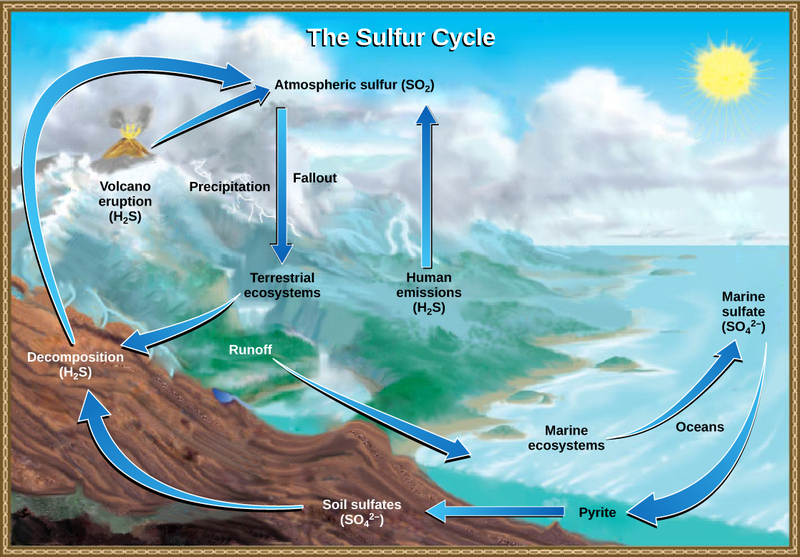 Sulfur cycles exist between the oceans, land, and atmosphere. Sulfur cycle: Sulfur dioxide from the atmosphere becomes available to terrestrial and marine ecosystems when it is dissolved in precipitation as weak sulfuric acid or when it falls directly to the earth as fallout. Weathering of rocks also makes sulfates available to terrestrial ecosystems. Decomposition of living organisms returns sulfates to the ocean, soil, and atmosphere. On land, sulfur is deposited in four major ways: precipitation, direct fallout from the atmosphere, rock weathering, and decomposition of organic materials. Atmospheric sulfur is found in the form of sulfur dioxide (SO2). As rain falls through the atmosphere, sulfur is dissolved in the form of weak sulfuric acid (H2SO4), creating acid rain. Sulfur can also fall directly from the atmosphere in a process called fallout. The weathering of sulfur-containing rocks also releases sulfur into the soil. These rocks originate from ocean sediments that are moved to land by the geologic uplift. Terrestrial ecosystems can then make use of these soil sulfates (SO42−). Upon the death and decomposition of these organisms, sulfur is released back into the atmosphere as hydrogen sulfide (H2S) gas. Sulfur may also enter the atmosphere through geothermal vents. 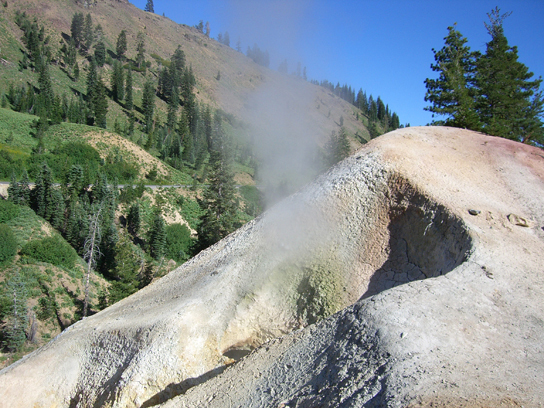 Sulfur vents: At this sulfur vent in Lassen Volcanic National Park in northeastern California, the yellowish sulfur deposits are visible near the mouth of the vent. Sulfur enters the ocean via runoff from land, fallout, and underwater geothermal vents. Some marine ecosystems rely on chemoautotrophs, using sulfur as a biological energy source. This sulfur then supports marine ecosystems in the form of sulfates. Human activities have played a major role in altering the balance of the global sulfur cycle. The burning of large quantities of fossil fuels, especially from coal, releases large amounts of hydrogen sulfide gas into the atmosphere, creating acid rain. Acid rain is corrosive rain that causes damage to aquatic ecosystems and the natural environment by lowering the pH of lakes, which kills many of the resident fauna; it also affects the human-made environment through the chemical degradation of buildings. For example, many marble monuments, such as the Lincoln Memorial in Washington, DC, have suffered significant damage from acid rain over the years. These examples show the wide-ranging effects of human activities on our environment and the challenges that remain for our future.